You need two things to develop a skill: knowledge and practice. Very little training is focused on practice. Popular video platforms are not designed for practicing skills. They don’t offer strong privacy control, integrated video recording, integrated video conferencing, and a marketplace where members can affordably engage with experts, said SpeakMeister CEO Cheryl Mathews. 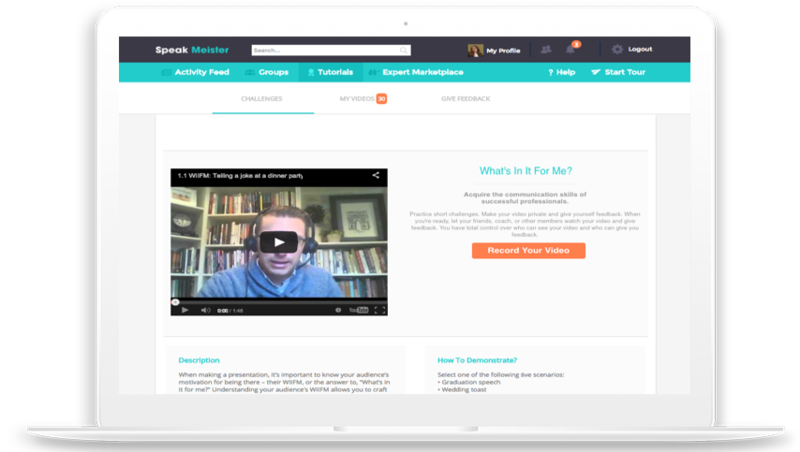 SpeakMeister is a free platform where members can practice skills such as presentations, job interviews, sales pitches, and other skills related to speaking or performing in front of others. These are pressure situations where practice builds confidence before a real-life performance. Other skills that can be practiced on SpeakMeister include stand-up comedy, debate, radio/TV appearances, webinar presentations, preaching, counseling, storytelling, acting, foreign languages and similar skills. The Expert Marketplace is where expert services are sold using a micro-payment model. Micro-payments make it affordable for members to ask questions or get expert feedback on their practice videos. Communication takes place over chat, email, phone or video conferencing. Experts create their own stores or auctions, set their prices and decide which modes of communication they will use. SpeakMeister includes 20 public speaking tutorials. Each tutorial is a bite-sized skill that members can practice in a group or on their own. It’s similar to learning dance steps where each tutorial builds on the previous one. SpeakMeister is a Virginia-based video platform company providing communications skills practice and coaching at speakmeister.com. The company also developed the online Public Speaking Fear and Phobia Program at https://speakmeister.com/edu. For press information, please see speakmeister.com/edu/press.